The following studies show that indoor air quality has a direct effect on cognitive performance and productivity and that CO2, once thought to be benign, negatively impacts cognitive performance and productivity. This study by the Harvard T. H. Chan School of Public Health shows that cognitive performance can be improved 101% by reducing CO2 and VOCs. 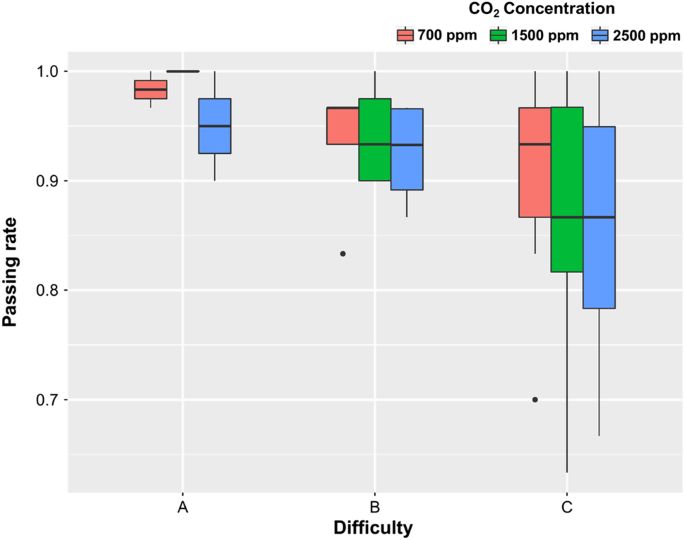 Even reducing CO2 alone can improve cognitive performance significantly independent of VOCs. This study by the Lawrence Berkeley National Laboratory shows the detrimental effect CO2 has on decision making. The study measured performance across nine different areas of decision making under varied CO2 levels.Relative to their performance at 600 ppm of CO2, at 1,000 ppm statistically significant, but moderate decrements occurred in six of the nine scales of decision making performance. At 2,500 ppm, large and statistically significant reductions in decision making capability occurred in seven of the nine scales. This study by the Harvard T.H. Chan School of Public Health shows the detrimental affect CO2 has on the performance of airplane pilots. Pilots performed advanced maneuvers in a flight simulator with CO2 levels at 700 ppm, 1,500 ppm, and 2,500 ppm. At 700 ppm of CO2, Pilots were 69% more likely to receive a passing grade on a maneuver than they were at 2,500 ppm of CO2. They were 52% more likely to receive a passing grade on a maneuver at 1,500 ppm than at 2,500 ppm of CO2. The study also showed that the negative effects of the CO2 increased the longer the pilots spent in the flight simulator. This study from the Lawrence Berkeley National Laboratory and the Helsinki University of Technology analyzed a wide range of research on the subject of indoor air quality and determined that in almost all of the studies found increases in performance with higher ventilation rates. This study from the International Center for Indoor Environment and Energy at the Technical University of Denmark demonstrated that the introduction of an air pollution source into an office environment negatively affected health, decreased attention to work, and reduced productivity. 22% of the subjects rated themselves as dissatisfied with the air quality when the pollution source was present and only 15% when it was absent. Furthermore, the prevalence of headaches increased (P=0.04) in the presence of the pollution source and subjects reported putting in lower levels of effort (P=0.02) during typing and calculation tasks. In the typing section, subjects worked significantly more slowly when the pollution source was present (P=0.003) and typed on average 6.5% less text. Reducing the pollution load on indoor air proved to be an effective means of improving comfort, health, and productivity. This study by the Lawrence Berkeley National Laboratory reviewed a wide range of literature and research on indoor air quality and concluded that there is strong evidence to suggest that the characteristics of a building and its indoor environment significantly influence the occurrence of respiratory disease, allergy and asthma symptoms, sick building symptoms, and worker performance.